PetStore.com Blog: Halloween Pet Costume Contest + 10% Off Everything! 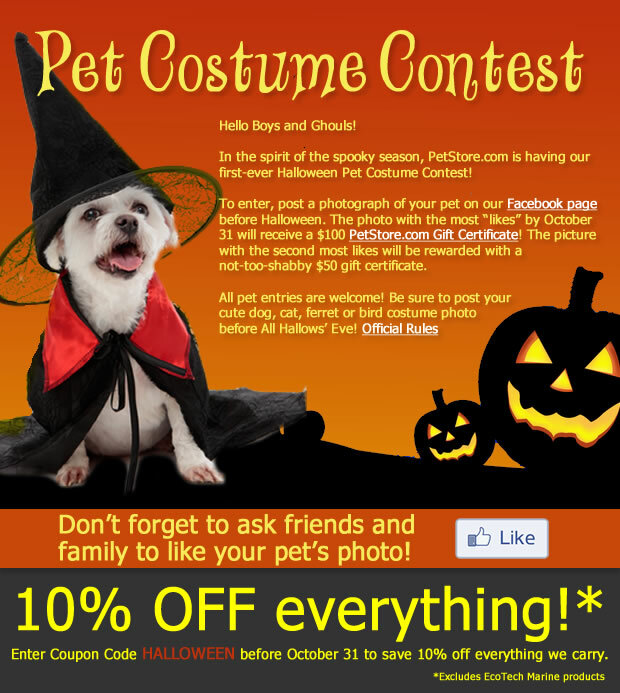 Halloween Pet Costume Contest + 10% Off Everything! In the spirit of the spooky season, PetStore.com is having our first-ever Halloween Pet Costume Contest! To enter, post a photograph of your pet on our Facebook page before Halloween. The photo with the most “likes” by October 31 will receive a $100 PetStore.com Gift Certificate! The picture with the second most likes will be rewarded with a not-too-shabby $50 gift certificate. All pet entries are welcome! Be sure to post your cute dog, cat, ferret or bird costume photo before All Hallows' Eve! Don't forget to ask friends and family to "like" your pet's photo. Read Official Rules. We're also have our first sitewide sale this month. Just enter coupon code HALLOWEEN during checkout to save 10% on any item we have in stock (excludes EcoTech Marine products). Enjoy $5.99 flat rate shipping, too, or spend over $75 and we'll ship your order for free!